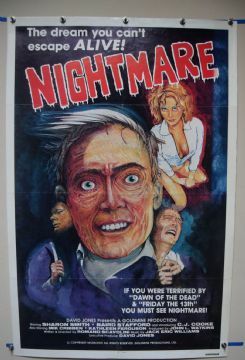 Nightmare (Goldmine Productions,1981) US One Sheet Poster Size 27" x 41"
An Italian giallo style film mixed with the American slasher genre. The film stars Baird Stafford, CJ Cooke and Sharon Smith. US International one sheet ((meaning it was printed in the U.S. for use in non-U.S. countries). Note the lack of a ratings box and NSS information. The poster has the lightest of fold wear and an edge tear on the top right fold which measures 1".